The images above shows the formulae that students need to know in Malaysia SPM Physics syllabus in Mind Map form. You may click on the image to enlarge it for a better view. You may also download and print it out for further reference. 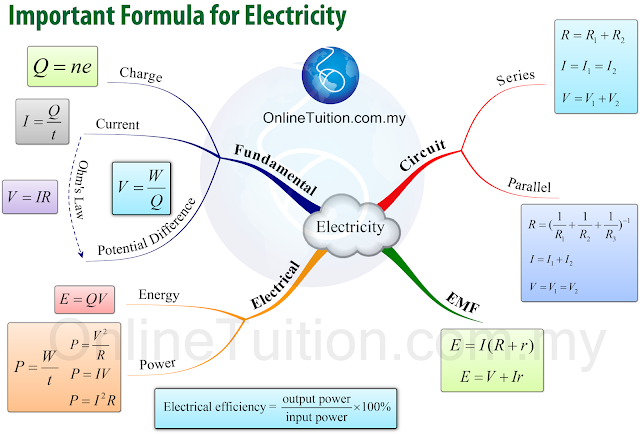 Electricity is the second chapter in SPM Form 5 Physics. There are a lot of formulae in this chapter, and most of them look similar. In order to answer the calculation questions, you must understand how the potential difference and current change in a circuit. Please share it with your friends if you found it useful.